Scientific Illuminism was described by Crowley as “The Method of Science, the Aim of Religion”. A number of attempts to explain magic through science have been made, including (but not limited to) The Science of the Craft by Bill Keith and Real Energy by Isaac and Phaedra Bonewits, both of which (similarly to Peter J. Carroll’s brand of Chaos magic) utilize quantum physics as the “how” of magic. 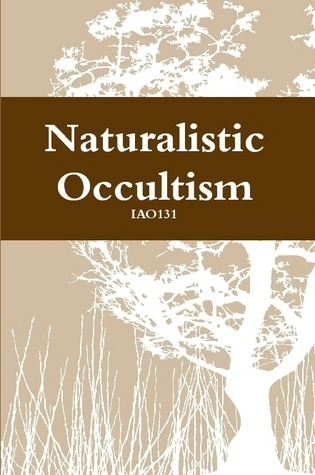 Naturalistic Occultism is much more psychology-heavy, explaining everything from astral projection to divination using almost exclusively various psychological models and schools of thought. Certain accusations (by others, such as some scientists) that psychology is a “soft” discipline aside, the author does a pretty good job of basic, bare-bones explanations. He certainly achieved his overall goal of explaining occult concepts and techniques without resorting to mysticism and superstition. For example, he shows how the astral body is actually the brain’s own perception and understanding of the shape and appearance of the physical body itself–the image that the brain carries of the body, as it were. This doesn’t stop him from including a brief appendix with instructions on how to astrally project using this concept. In short, there needs to be more, because this is a good start. Overall, I liked the book, and I’m only docking it points for its brevity. If you want a very concise look at the psychological model of magic, this is a good text to have on hand. And there most certainly need to be more rational approaches to a series of topics that often fall prey to ridiculousness and need some serious paring with Occam’s Razor. More writing from IAO131 along this vein would be one such welcome thing, to be sure.